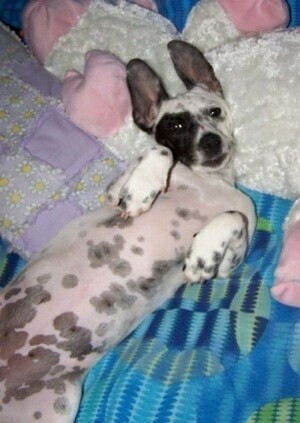 Tinker the Chihuahua / Dalmatian mix (Chimation) at 9 1/2 months old—"Tinker is an absolute doll. She is very smart, with personality plus, was very easy to train and we have had so much fun with her. She is very loving and loyal and I now wish I would have gotten her mirror twin sister at the same time. We are so happy with her and she is so loved by everyone in the family." The Chimation is not a purebred dog. 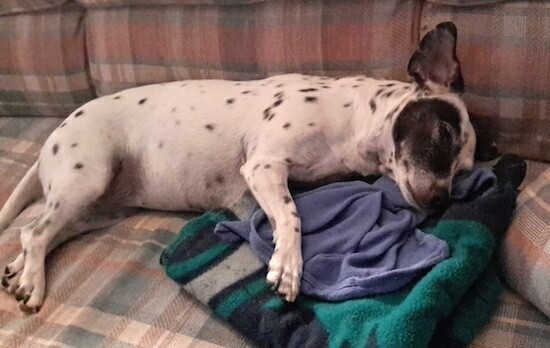 It is a cross between the Chihuahua and the Dalmatian. The best way to determine the temperament of a mixed breed is to look up all breeds in the cross and know you can get any combination of any of the characteristics found in either breed. Not all of these designer hybrid dogs being bred are 50% purebred to 50% purebred. It is very common for breeders to breed multi-generation crosses. 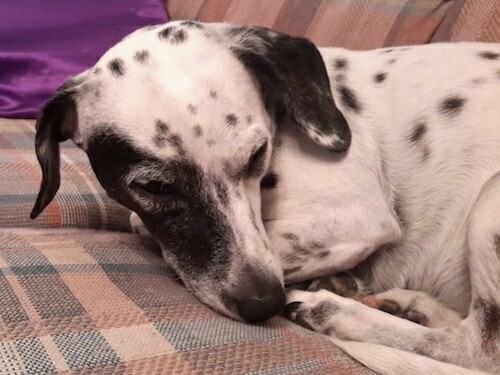 Tinker the Chihuahua / Dalmatian mix breed dog (Chimation) at 8 years old—"My sweet little Chimatian Tinker is now about 8 years old and has been through a lot in the last couple years. In her new pictures you can see she has aged by the gray around her face, especially around her eye. We love her so much. A couple years ago my daughter was taking her for a walk and a dog came running at her in his yard through his fence and scared her so bad she pulled out of her collar and leash and ran. We tried to catch her and she just kept running clear up a huge hill/mountain. As I called her name she stopped, looked back at me and started running again. We were devastated as we saw her reach the top and disappear. We immediately went all over town looking for her, made over 100 lost posters and placed them all over town. I must have driven all over town looking for her. It was in the middle of summer, we were having 100°F+ temperatures for over a week. I was so afraid that I would never see her again with the heat and coyotes around. I was so depressed. A week went by and I had prayed and prayed and still no Tinker. The 8th day (which was my birthday), I took a walk at night 10:00 pm or so in my flip flops. I walked from my house clear down to the police station (about 3 miles), calling Tinker's name the whole way. I came home and crawled into bed crying my eyes out. On the 9th day, as I was sleeping, I heard my husband talking to someone. I looked at the clock, it was about 4:30 am. He came back to the bedroom to tell me I had a visitor. I couldn't imagine what he was talking about. But it was my Tinker!!! She found her way home. I still think by walking through town, she picked up my scent and followed it home. My husband was up getting ready for work. He was eating breakfast and heard a scratch at the front door. He was shocked when he went to the door to see her starting to walk away. He called her name and she came running back. It was the best Birthday present EVER! She was in surprisingly good condition. 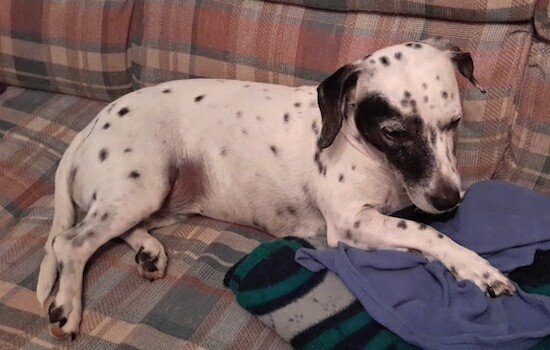 She had lost some weight, had one tick and a skin infection, but she was back and we were happy. The only problem she has is doggy PTSD. 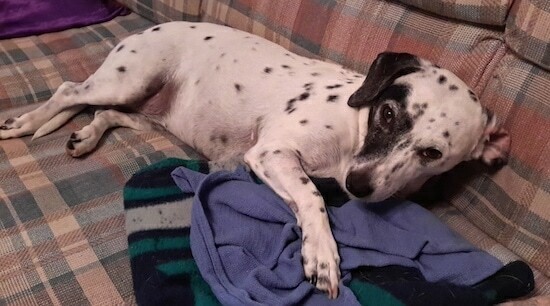 She is afraid of literally everything and has nightmares. It breaks my heart to see this once loving dog to everyone, only trust our family. She is afraid of every little noise or thing she has never seem before. BUT we have our little girl back and I can't imagine life without her." "This is a picture of our new puppy. Her name, I think, is going to be "Tinker" (the kids are not positive of it yet). She is a sweetie. 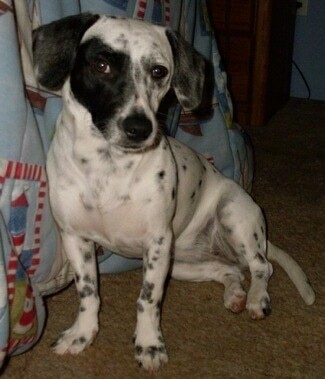 Her mom is a beautiful Dalmatian and her daddy is a larger size Chihuahua. She came from the 3rd litter of the same parents born on Christmas Eve. The owners have both the male and female. They are just darling. 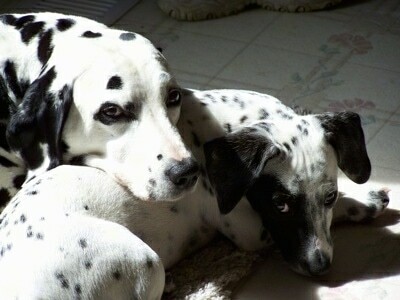 They were advertised as "Mini Dalmatians" but I guess you could call them Dallyhuahua."